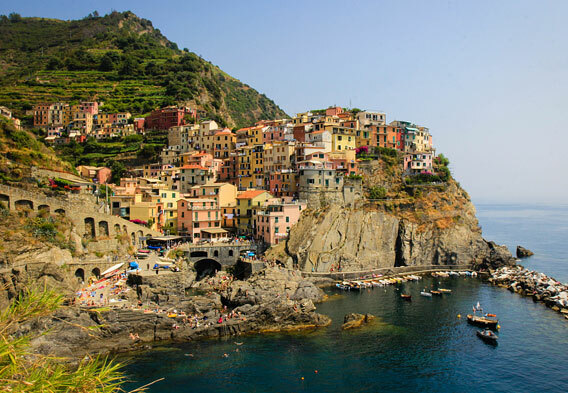 The Cinque Terre area has some of the best food in Italy and is the birthplace of pesto and focaccia bread. Hiking trails link the five villages of the Cinque Terre together and offer stunning views of the area. There is also a paved trail the extends from the village of Manarola to the village of Riomaggiore. Other ways to get from village to village include taking a train or boat. Cars cannot reach these charming enclaves from the outside. The five villages in the Cinque Terre and the hillsides that surround them are all part of a UNESCO World Heritage Site and the Cinque Terre National Park. The Cinque Terre has its own wine cooperative that is known as the Cooperativa Agricoltura di Riomaggiore. The two most renowned local wines are Sciacchetra (a dessert wine) and the eponymous Cinque Terre. The houses in the Cinque Terre are known for their different colors. It has been said that this has a specific purpose. So that the fisherman working just offshore could see their houses easily and could verify that their wives were still at home taking care of the house work. The Cinque Terre almost seems like something out of a fantasy travel brochure. A more dramatic and romantic destination you will hardly find anywhere else on the planet. So special is this area in Italy that it was designated as a UNESCO World Heritage Site in 1997. Once a rather unknown destination, this formerly "undiscovered Eden" now welcomes throngs of travelers, especially on summer weekends. What is the appeal, you might ask? Quite simply, the five different villages that are found in the Cinque Terre almost seem to have been plucked out of the past and are true scenic delights. It gets better when you also consider the area's scenic cliffs, hidden coves, tempting beaches, and network of walking trails that afford plunging views down to the Mediterranean Sea. For our summary of the Cinque Terre villages, we start with Vernazza. 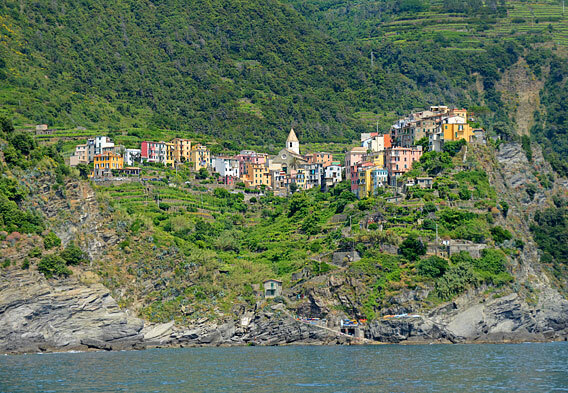 Heading from south to north, this is the fourth of the Cinque Terre enclaves that you will come across. A pretty village if ever there was one, Vernazza features tall, multi-colored houses that are set around a glorious harbor where you can swim among the fishing boats if you please. Back on land, claiming one of the café tables at the waterside plaza of Piazza Marconi and dining on authentic Italian food is among the most tempting options for things to do. 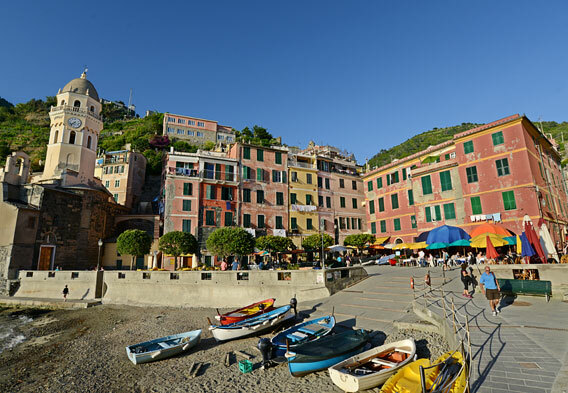 Being a coastal area, Cinque Terre is known for its fresh fish and seafood. Other culinary highlights in the area include pesto Genovese, an abundance of porcini mushrooms, tegame alla Vernazza, and the free flowing Cinque Terre wines. And this is where focaccia came from. To expand on tegame alla Vernazza, this most typical main course in the Cinque Terre region consists of a blend of anchovies, potatoes, tomatoes, white wine, oil, and herbs. The anchovies here, by the way, are fresh and better than any you've likely had before. When Vernazza visitors aren't dining on what is widely considered to be some of the best food in Italy, they can savor views of the village's castle, which sits atop a rocky promontory. Hiking along the Cinque Terre trails that link all of the area's five towns together is also an option. As is true of the other villages in the area, the lodging at Vernazza consists of a good array of rental apartments that are complemented by at least one 4-star resort. Intimate hotels and B&Bs are also in good supply. 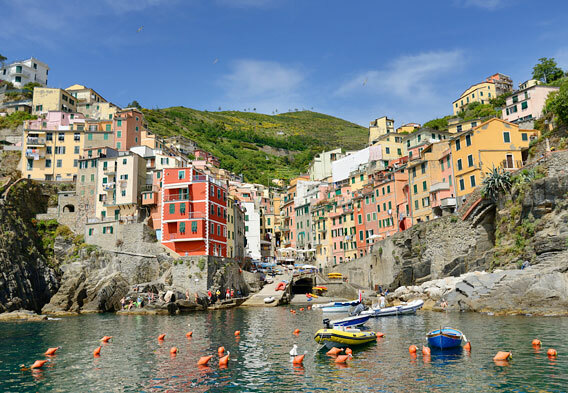 While there is a wide array of Cinque Terre accommodations, it should be noted that during the peak summer travel season, lodging can be hard to come by if you don't book in advance. Ocean view properties are especially prone to filling up fast. The largest and northernmost village in the Cinque Terre, Monterosso is a relatively bustling place that features a wonderful Old Town district that lies behind the harbor. When visitors aren't exploring the Old Town, they can head to the village's beaches. Of particular interest in relation to beaches is the fact that Monterosso is where you will find the area's only extensive sand beach. The other area beaches feature more in the way of pebbles than they do sand. 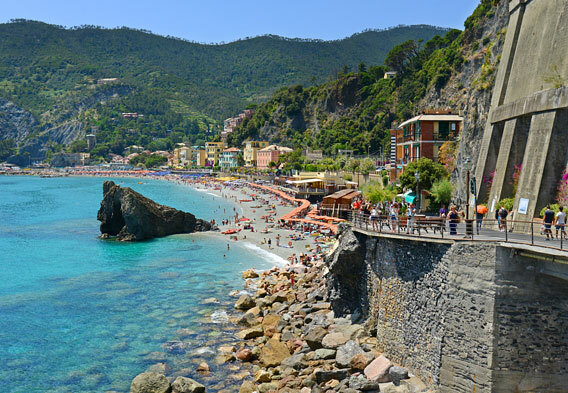 At several of the Cinque Terre beaches, it is possible to rent umbrellas, chairs, lockers, and kayaks. Showers are in good supply. At the private beaches, it is usually required that you at least rent umbrellas and chairs. The public beaches don't typically have such requirements. If you aren't planning on spending a lot of time in the Cinque Terre or your budget is tight, the public beaches might be the best options. Other notable features in Monterosso and the Cinque Terre area in general include grapevines, olive trees, and lemon trees that can be found on the surrounding hillsides. No discussion about Monterosso would be complete without also mentioning the village's Convento dei Cappuccini. It is at this convent where you will find the area's most famous art treasure - a crucifixion by Anthony Van Dyck. The southernmost village in the Cinque Terre, Riomaggiore boasts a wonderful collection of colorful buildings that work their way down the cliffs to the sea below. Historic character abounds here, and the town's vineyards turn out some savory wines. Numerous restaurants, bars and shops line the main avenue - the Via Colombo - and visitors can also interest themselves in the village's pebbly beach. The water and mountainsides in Riomaggiore have been designated as national parks, and just east of the village is a nature observation center known as the Torre Guardiola where visitors can bird-watch and view the local flora. You can reach the observation center via the trail that begins just west of Fossola Beach. In Manarola, clusters of tall houses climb atop one another up the hills that are found on either side of the harbor. Many of the businesses here revolve around fishing and winemaking, and it is in Manarola that you will find the region's major wine cooperative - the Cooperativa Agricoltura di Riomaggiore. Sciacchetra, a rather sweet and potent dessert wine, is among the most renowned of the local wines. Manarola, like the other villages in the Cinque Terre, has been around for quite some time and has plenty of historical appeal. Its main church - San Lorenzo - has a cornerstone that dates back to 1338. In Manarola, you can hop on the Via dell'Amore, or Lovers' Lane, which is a well-paved coastal path that links the village to Riomaggiore. Along the way, walkers can stop at picnic areas or take a break on one of the pebbly beaches. Other trails that are ideal for scenic walks wind their ways through the hills and vineyards above town. Corniglia is the quietest village in the Cinque Terre area. This might just be due to its relatively isolated location midway down the coast. Whether they are arriving by way of trails, boats or trains, Corniglia visitors who are coming from the south have to climb more than 300 steps to reach the village proper. If you wish to avoid this climb, which really isn't that bad if you are in good or even just decent shape, you can arrive from the north via a hiking/walking trail. Regardless of how you choose to get to Corniglia, once you are there you are treated to some amazing views of the surrounding vineyards and the picturesque coastline. It is quite an intoxicating blend of visual splendor. The best views are arguably those that can be savored from the belvedere that is found at the end of the village's main street. Finally, Corniglia might just be the best village in the area to observe how life in the Cinque Terre used to be before the tourists started arriving a couple of decades ago.